Christo made his first packages and wrapped objects as part of a group called Inventory while living in Paris in 1958. Thus began the artist's distinctive career of wrapping, covering, draping, and folding fabric over, through, and around everyday objects and constructed and natural forms. He eventually extended this practice of using fabric to include large-scale urban and rural sites; since the early 1960s, he has collaborated on these outdoor projects with his wife Jeanne-Claude. Taking their work outside the confines of conventional exhibition spaces, Christo and Jeanne-Claude have maintained a creative independence that extends beyond galleries and museums. Christo is the sole author of the packages and wrapped objects, along with the studies for the outdoor projects. These works are the only collectable elements of his work, owing to the temporal nature of the outdoor projects. Fabric has been the common denominator in Christo and Jeanne-Claude's work for over forty years, and has ranged in type from found materials to custom industrial weaves. The artists' formalist concerns embrace the properties of fabric: its folds, pleats, and drape, which are created by the ropes or lines that bind or support it. Beyond these physical dimensions, however, Christo and Jeanne-Claude's work infiltrates the social fabric of the time and place where it is created. Package 1974 was made in New York City specifically for Dorothy and Herbert Vogel, whom Christo and Jeanne-Claude had met in 1971. Christo chose for this work an ocher tarpaulin he had acquired in 1968 as one of the sample fabrics for his proposal for wrapping the Museum of Contemporary Art in Chicago in 1969. While the projects and wrapped objects obscure recognizable forms, the packages often conceal ambiguous contents. This ambiguity endows the packages with an abstract quality that is engagingly ironic, given that they are packages and, as such, everyday objects. 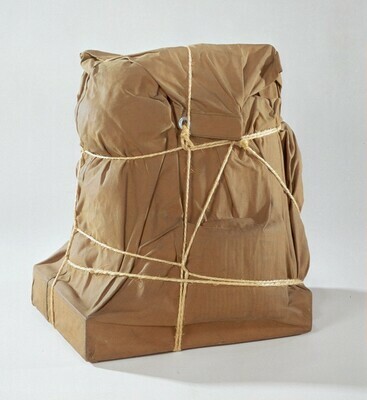 In making Package 1974, Christo covered an undefined mass with tarpaulin and neatly bound it in rope tied in a horizontal, vertical, and diagonal orientation. The artist has said this sparse and predominantly rectilinear format was determined by the heaviness of the tarpaulin. The pattern of rope in Package 1974, which is evocative of the minimalist grid of the mid-to-late 1960s, contrasts with that of Christo's more randomly bound packages, whose allover array of lines on canvas is reminiscent of Jackson Pollock's webs of paint. 1. Bourdon's essay "Packaging: Revelation through Concealment," is in <i>Christo</i> (New York, 1972).2. See Daniel Thomas' article, "Australia, Bulgaria, <i>Christo,</i>" in Christo [exh. cat., Art Gallery of New South Wales] (New South Wales, Australia, 1990), 28 - 29.3. Christo, in Barbaralee Diamondstein, <i>Inside New York's Art World</i> (New York, 1974), 94.4. The artist conveyed this information in conversations with the author on 10 and 21 January 2000. The artist; acquired 1974 by Dorothy and Herbert Vogel, New York; gift 1992 to NGA. Painting, Drawing and Sculpture of the '60s and the '70s from the Dorothy and Herbert Vogel Collection, Institute of Contemporary Art, Univ. of Pennsylvania, Philadelphia; The Contemporary Arts Center, Cincinnati, 1975-1976, 10, as Untitled Package. Works from the Collection of Dorothy and Herbert Vogel, The University of Michigan Museum of Art, Ann Arbor, 1977-1978, no. 51.
from the collection of Dorothy & Herbert Vogel, Arnot Art Museum, Elmira, New York, travelling exhibition, 1988-1989, 100. From Minimal to Conceptual Art: Works from The Dorothy and Herbert Vogel Collection, National Gallery of Art, Washington, D.C., 1994, no. 31, color repro. From Minimal to Conceptual Art: Works from the Dorothy and Herbert Vogel Collection (NGA National Lending Service Exhibition), The Jack S. Blanton Museum of Art (formerly Archer M. Huntington Art Gallery), University of Texas, Austin, 1997, as Package. From Minimal to Conceptual Art: Works from the Dorothy and Herbert Vogel Collection (NGA National Lending Service Exhibition), Tel Aviv Museum of Art, 1998, as Package. From Minimal to Conceptual Art: Works from the Dorothy and Herbert Vogel Collection (NGA National Lending Service Exhibition), Wäinö Aaltonen Museum of Art, Turku, Finland, 1998, as Package. Christo and Jeanne-Claude in the Vogel Collection, National Gallery of Art, Washington, D.C.; Museum of Contemporary Art, San Diego, 2002-2003, no. 4, repro. Christo and Jeanne-Claude, Asheville Art Museum, 2009, no catalogue.